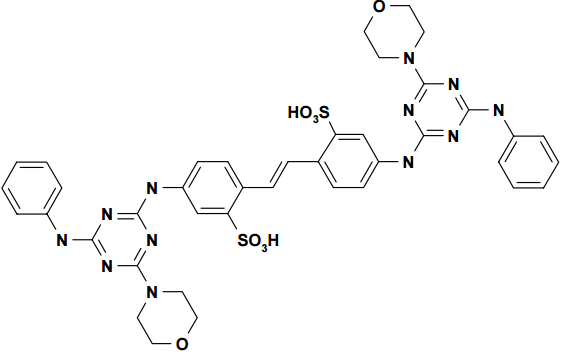 Viobrite DMS-X is a stilbene derivative type of optical brightener which has C40H38N12Na2O8S2 as chemical formula. This fluorescent whitener is mainly used in laundry detergents. Other applications include textiles and paper. This product is also known as FWA-1, fluorescent whitener 71. DMS-X is not stable towards bleaching processes and has a high affinity to cellulosic fibers. It can be used in combination with Viobrite CBS (Distyrylbiphenylsulfonate ) to achieve the optimal performance. Available packaging: 25 KG bags / 400 KG big bags / 500 KG big bags. Other packaging is available on request. Viobrite DMS-X is on stock in both Europa. Our lead time is about one week. Store this stilbene derivative brightener in a cool, dry and well-ventilated area and in line with legal requirements. This substance (CAS: 16090-02-1) has been registered under REACH (EC) 1907/2006. A Material Safety Data Sheets (MSDS) is available for Viobrite DMS-X and all other products supplied by Vesta Intracon BV. An MSDS describes the hazards of a product and explains how a product can be safely handled, used and stored. Besides it provides important regulatory and emergency response information for the purchased product. Fluorescent brightener 71: Disclaimer. This information is supplied solely for informational purposes and Vesta Intracon bv makes no guarantees or warranties, either expressed or implied, with respect to the accuracy and use of this data. All product warranties and guarantees shall be governed by the Standard Terms of Sale. Nothing in this document is legal advice or is a substitute for competent legal advice.